The EK Series is an energy miser fitted with our latest ~AC generation controllers for hydraulic, travel and steering motors. The controllers provide exceptioinal energy conservation. The EK Series turret forklift trucks have an enclosed battery compartment with hinged (removeable) doors and cover. 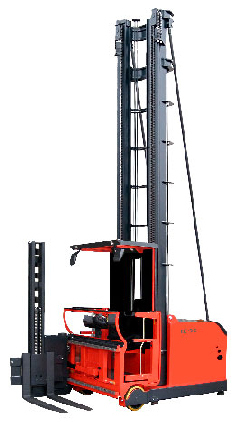 Standardly supplied with a battery tray suitable for exchange using a standard counter-balanced forklift. Battery compartment rollers and hinged conveyor options are available.